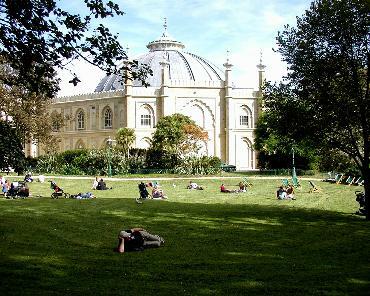 Inspired by the Corn Exchange in Paris and originally covered with a huge segmented glass dome, the remarkable Brighton Dome (shown to the right) was designed as the Prince Regent's riding stables and was finally completed in 1805. Part of the famous Royal Pavilion Estate, it was later converted into a Concert Hall in 1866 and became the most fashionable and culturally significant venue in the south. It was restored again in 1935 with a resplendent art-deco interior, and showcased some of the world's biggest names in entertainment. From 1967 onwards, it became a regular haunt of Pink Floyd, and they chose the venue to start their 1972 tour. The atmosphere at Bighton Dome was one of indifference. As Pink Floyd ran through "Echoes" the uniformed officials sat stone faced and silent at the back. There were a few, unimpressed chicks down the front. And Floyd just couldn't get the effects to combine with the music, although they were trying hard. A couple of times they stopped. Gilmour shouted suggestions at the sound crew, situated at the back of the front stalls. Finally things started to go well: the music slowly took on the unmistakable Floyd force and cohesion. But that was temporary. The band had arrived early afternoon; preceded by roadies at nine in the morning. Things just had to be right. Floyd always strive for perfection. The combination of technology and musicianship has to be total - otherwise the resulting sound loses all impact and interest. And Floyd know that too well. The opener of a tour can be a hairy experience. Since their return from the States they have worked hard on new material, and rehearsed for several days at London's Rainbow, and also at the Rolling Stones factory, in downtown Bermondsey. The new material was long overdue; they had still been playing "Careful With That Axe Eugene" and "Set The Controls For The Heart Of The Sun." And they don't dig a complacent approach to creativity. A spirit of revitalisation had come into the band. "I think," explained Nick Mason, "all of us feel more excited that we have for ages, because we have new material and new equipment." Floyd's "Atom Heart Mother" - "Echoes" period has been described as unproductive. Certainly there are similarities in structure between the two pieces. But the "unproductive" question is crap, because that whole period, which dates back to 1970, made it so obvious that the band were creating original material. "Echoes" was only possible because of "Mother," and it expressed more. And as Floyd opened the first set of the British tour - incidentally the first time I've seen them since 1970 - a new piece, tentatively titled "The Dark Side Of The Moon," showed that their writing had taken on a new and again innovatory form. A pulsating bass beat, prerecorded, pounded around the hall's speaker system. A voice declared Chapter five, verses 15 to 17 from the Book of Athenians. The organ built up; suddenly it soared, like a jumbo jet leaving Heathrow; the lights, just behind the equipment, rose like an elevator. Floyd were on stage playing a medium paced piece. The Floyd inventiveness had returned, and it astounded the capacity house. From the easy-paced tempo, the music gained exuberance, and they went into a racing jazz-based riff. Rick Wright on piano provided some delightful filling, with Gilmour's guitar interweaving well, and the team of Mason and Waters as solid as ever. The song's structure bore little resemblance to their earlier material. There was a definite jazz feel throughout many of the passages. At the beginning we had the quasi-religious element, and this became more apparent in the middle. "Let the Holy Spirit fill you," the voice urged. "Speak to one another. Sing and make music in your hearts to the Lord." Other voices, on the quadrophonic system, professed other feelings. At one time three voices fused into complete confusion, and ended with the Lord's Prayer. Pretty hot stuff. All that the band said in that piece was directly related to themselves. And it's so new that they were still arranging it on the way down to Brighton. Mason told me after the show: "The piece is related to the pressures that form on us and other people generally. That is the very rough theme - although it doesn't really relate to us as much as we'd originally planned. "The various pressures that we talked about when we wrote it were physical violence, travelling, money, religion. Those were the things which we thought sidetracked people from things we thought might be important. And religion for us is one of those things. I mean, not religion as much as Christianity as practised by a large section of the population of Britain." Unfortunately those profound sentiments were lost as a result of two things. One was that the vocals were none too clear, and secondly, the number broke down 30 minutes through. A drone and a hissing sound filled the hall as Floyd went into a simple riff. Gilmour turned to Waters and spoke. We didn't catch what it was he said, but it had a staggering effect. 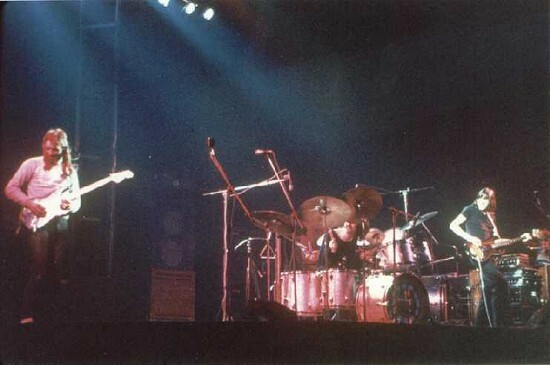 Waters removed his guitar, and both he and Gilmour left the stage. Up until then the music had been fine. A mood had captivated the audience, and now they didn't quite know what to make of it. "That wasn't pretty," said Waters. "We'll fix that." And later, when the band returned to the stage, he explained: "Due to severe mechanical and electric horror we can't do any more of that bit, so we'll do something else." "I don't know if you heard," Mason edified, "but basically what happened was the most incredible tone started rushing through the PA. The scene is the new lighting system is run off a seperate circuit, and due to some power failure somewhere we had to double up on the circuit, so it was on the same circuit. "There was a variac on the lighting system which went wrong, and shorted out the PA. So it was impossible to get any tapes through, any sounds through, and we stopped because there was nothing we could do. "I think, in that situation, you have to decide whether the show must go on, or whether it's better to stop the show and sort things out - which is what we decided to do." They restarted the show with part of the "Atom Heart Mother" suite. And they were a new band. The beginning was not too good, but then Floyd flew high. The music flowed naturally, and Gilmour did one hell of a job on vocals during the normal choir piece. But it was disappointing that such a remarkable new piece should collapse abysmally part way through. Even more disappointing was the fact they restarted the second half with "Careful With That Axe Eugene." Mason told me afterwards: "We were all tensed up. And we decided that if we started off with "Cut You Into Little Pieces" - which is a very loud, and slightly complex number in terms of getting the electrics right - we might get into trouble and start, well, banging about. "So we thought we'd use 'Axe.' Basically it was a big disappointment to use old stuff. But it couldn't be helped. I think probably it was better to do that." This nervous pressure on the band resulted in one of the most brilliant sets I have ever heard them perform. "Echoes" was masterful. The vocals came over clearly. What they achieved on the album they strove to perfect, and did so successfully. Mason said: "Frankly, I thought some of tonight was fantastic. Like there's all sorts of cueing things that we have to sort out, but the lighting system is amazing. It's a new start." Oh, he's right. That new piece expressed succinctly in musical terms the innermost feelings of a person, including the strain of being one of this country's top bands. At no time during the performance were Floyd untogether. The musicians go together like salt and vinegar on fish and chips - it is that sort of tasteful relationship. Floyd proved to me that they are the leading explorers of electronic music. Their effects, which are always used economically, create an intriguing interest. And that music; it's so good. - New Musical Express, 29th January 1972.